With her new book, “Ferment Your Vegetables” (Quarto Publishing Group), Philly-based author Amanda Feifer helps familiarize today’s home cooks with an age-old food preservation method. Feifer contends that pretty much anyone is capable of filling their kitchen counters with jars of tasty homemade sauerkraut, pickles and kimchi. Below, find a recipe from Feifer's book that's perfect for beginners. Fair warning: You might become a fermentation addict. In a pretty foolproof process, radish pickles remain an especially easy first step. I always have a jar of plain radish pickles fermenting at my house, simply because they’re so easy to make and taste so good that we tend to eat the whole jar very quickly. These make a great base for gluten-free, low-carb, paleo and vegan appetizers, but to be honest, I usually just eat them French-style, topped with a bit of cultured butter or entirely without adornment. Cut any soft or visually unappealing parts out of the radishes, but leave as much as possible intact. Slice into ¼-inch (0.5-centimeter) thick rounds. Layer radish and onion slices into a wide-mouth pint (500-milliliter) jar. There should be about 1½ inches (4 centimeters) of space between the radishes and the rim of the jar once they’re all in. Mix the salt into water until dissolved and pour this brine over the radishes, ensuring that there is a thin layer of brine over the vegetables. You may need to push the radishes down with a clean finger to gauge the fullness of the jar. Using your preferred method (see pages 23 to 28 of "Ferment Your Vegetables" or check Phickle for tips), submerge your veggies and cover your jar. 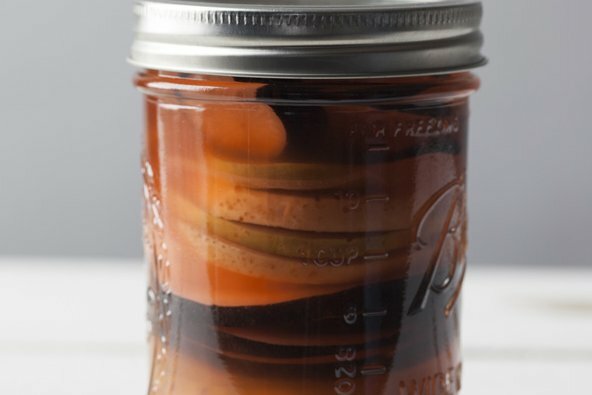 Place your jar on a small plate or bowl and allow to ferment at room temperature for six days to two weeks. Once you're happy with the flavor and acidity, remove the weight, secure the lid and place the jar in the fridge. Enjoy chilled.